Hello! I hope your week is going well! I wanted to share a couple of cards I created with the new Hero Arts kit. I’ve really enjoyed working with this set! The first thing I did was to stamp and color all of the flower images, and a lot of the containers with Copic Markers. Then I played around with pairing up the images. My first card used the large Sweet Pea image, along with the mason jar. Instead of stamping and masking, I used an X-acto knife to cut along the lines on the jar around the top, so I could slide the stems in. I cut the large white panel from the MFT Stitched Rectangle Scallop Edge Frames and the smaller Sno Cone panel from MFT Stitched Mini Scallop Rectangles. I adhered the large white panel with fun foam, and the Sno Cone panel with a tape runner. The flower images where adhered with foam tape. I stamped the sentiment from the HA kit with Altenew Jet Black ink. I finished the card off with Wink of Stella clear shimmer on the flowers and Grape Jewels from Lucy’s Cards. I also covered the mason jar in Glossy Accents. You can see all the shimmer here. The next card is rather similar to the first one. I used the large Lilac image and wrapped the bow around it instead of using a container. The main difference on this card is that I stamped the single lilac image and the butterfly on the white background in MFT Gray Grout ink, and I used vellum for the smaller panel. I also stamped the sentiment from the set in Versafine Onyx ink and heat embossed it with the Wow Hologram embossing power. Check out the color below. The third card is very different. I knew that I was going to have a hard time wrapping my head around putting flowers in a rain boot. So, I didn’t. Instead I used the image on it’s on. Well, I added the butterfly. I used one of my Distress Oxide ink panels for the mat. I tried some patterned paper, but this was the best fit. I stamped the sentiment from the kit in Fossilized Amber Distress Oxide ink to tie in the color. Both the boot and the butterfly are ahdered with foam tape, and I adhered the Distress Oxide ink panel with fun foam. I covered the boot in Wink of Stella clear shimmer before covering it with Glossy accents. The butterfly also has Wink of Stella clear shimmer. I used a kraft card base. Orange and yellow Lucy’s Cards jewels finish it off. I love how the rain boot turned out! My last card features one of the add-on items. This is the Butterfly Confetti Fancy Die and it was love at first sight! There are so many options with theses card size dies. You can use it for confetti for shakers, use the negative space for a quick background, or inlay some of the die cuts. Here I used one of my Distress Oxide panels. I die cut the butterflies and saved the butterflies (always save the confetti!). I also die cut the butterflies from Silver Sparkle Paper and from white cardstock. I used MFT ‘s Mini scalloped Stitched Rectangle Frames to trim down my main butterfly panel. That was tricky as the frame ended up with butterflies that overlapped, and I had to put it back together. A lot of this card was like a puzzle! My plan was to put some of the butterflies back, inlaying them. I wanted to use the original butterflies and some of the silver sparkle die cuts. The reason I cut out an extra butterfly panel from white cardstock was because I wanted to layer some of the butterflies to add interest and dimension. Some of the butterflies were just inlaid, some had 2 layers, on up to 4 layers! I ended up putting a strip of silver sparkle up the center of the card. 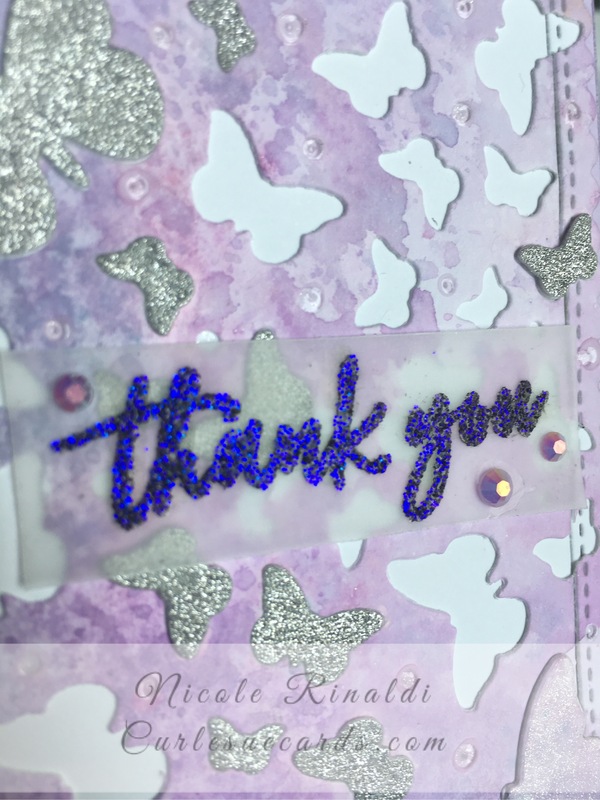 I added Wink of Stella Clear Shimmer to the colored butterflies and stamped the Thank You from the kit in Versafine Black Onyx ink on vellum and used Wow Hologram embossing powder. I love how it takes on a purple color when tilted. I had planned on the sentiment strip spanning the width of the card, but my first attempt failed (the embossing powder flaked off the vellum because I was handling it too much). At that point I was tired and already a couple of hours into this card, so I took the easy way out. I think next time I will use white embossing powder. Even though I love the Hologram powder, white would have been a better match. Now to figure out what to do with the rest of the images!